Ten days ago, on a bitterly cold Sunday morning, I ventured to West County to check out a Specialized Hot Rock. Big thanks to reader Melissa for pointing out this listing on Craigslist (and for sharing her positive experience with this bike)! I’m pretty sure I’d skimmed right over this listing multiple times, probably due to “Hot” making me think of the Hot Wheels bikes, and the fact that, although I know that Specialized is a good brand of bicycle, my radar was looking for Giant and Trek, since those are the brands of kids’ bikes that I’d looked at in bike shops. Anyhow, the bike was well-loved, but the price was right (or right-ish; it didn’t come with training wheels, and I might have tried to bargain more if I’d known that new training wheels would cost $25 — in my head I was maybe thinking half that?). It could use new hand grips, and I’m thinking something colorful would be nice. The current Hot Rocks come with chain guards, and we’re looking into adding one, but it may be more trouble than it’s worth. Unfortunately, the weather is conspiring against us, so we have yet to even SHOW the bike to Gabriel. We’d really like him to be able to hop on and ride when he first sees it. The Sunday I brought it home was just too bitterly cold. I mean, we probably could have bundled up and gone out, but it didn’t sound fun AT ALL. That night, we got our first significant snow of the year, and for the next week, he would have needed studded tires to ride the thing. And then more bitter cold. The bike is nice and light, which was one of our goals in getting a bike-shop bike. It has coaster brakes instead of hand brakes, which is not my first choice, but it should be fine for a first bike (and probably less confusing than having both coaster and hand brakes). If you’ve been reading for awhile, you’re probably aware that our plan was to do the balance bike thing and skip the training wheel phase. At this point, I would say that we’ve sort-of done the balance bike thing. G has had his Strider balance bike for over two years now. He’s perfectly happy to scoot around on the thing, but I can’t get him to take his feet off the ground. In general, he’s somewhat cautious/risk-averse, so, while this is a bit frustrating, it’s not terribly surprising (and we’ve benefited from his cautious nature in other ways, no doubt). Anyhow, we’re planning to introduce the new bike without training wheels, but I’m keeping my expectations in check. I really doubt it will work, but it will be easier to add training wheels (I already bought a set) than to take them off. Now we just need the weather to cooperate! 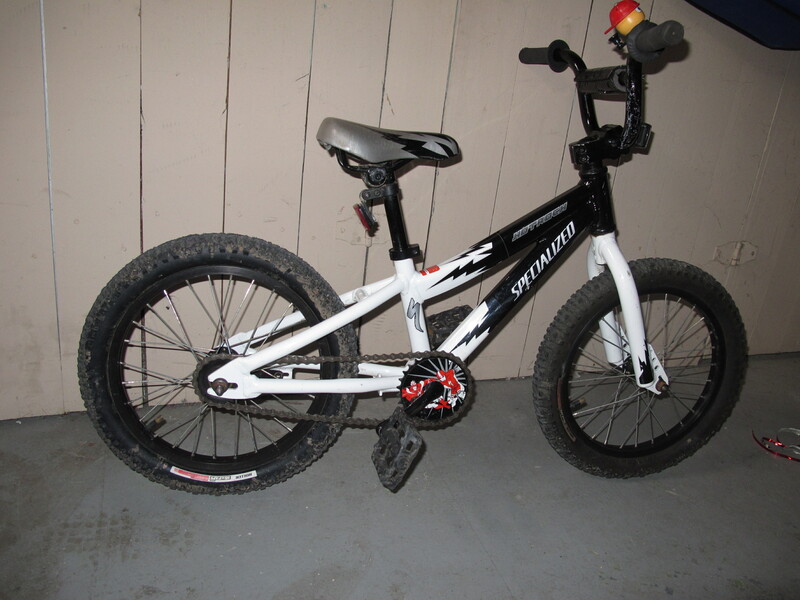 This entry was posted in Biking and tagged buy used, kids bikes. Bookmark the permalink. Woo Hoo! I’m a huge fan of the Specialized brand. My road bike is a Specialized Ruby and it was just hands down more comfortable than anything else I test rode. And somehow I’ve ended up with Specialized shoes, and shorts and a whole pack of other accessories – not out of “brand loyalty” but just because they were the ones that worked best for me. Hope your weather cooperates so that bicycle boy can get out and enjoy his new ride! I’ll look around the shop and see if we have any take-off training wheels for this bike. 16″, right? I’m ambivalent about training wheels, anyway. They don’t teach balance. Better to take off the pedals for a while and let him scoot around on it (Flintstone style) for a bit, especially if he has the pedaling thing down from other machines he’s used. The big thing for a chain guard is keeping small fingers and toes out of the chain/sprocket interface. Many bike shops can get you cheaper chain guards as replacement parts for $20 or so. I’m not sure I’d worry about it, as long as you make it clear to him that hands and feet don’t go there. Tom, it is a 16″. If you have a set that wouldn’t otherwise get used, great, but if not, we can just go with a set from our LBS. Looks like we might finally get to take it out this weekend!